Time functions as a filter, carefully selecting what is being brought to the surface. These are not experiences in their true shape and form – after all, this is not even possible to achieve – but rather a message of hope for the future contained in that past experience. Our judgement of past experiences is altered by the outcome of these experiences, as well as by the promise of a possible future these experiences contain. All of this is then further distorted by our continuous direct participation in the story. 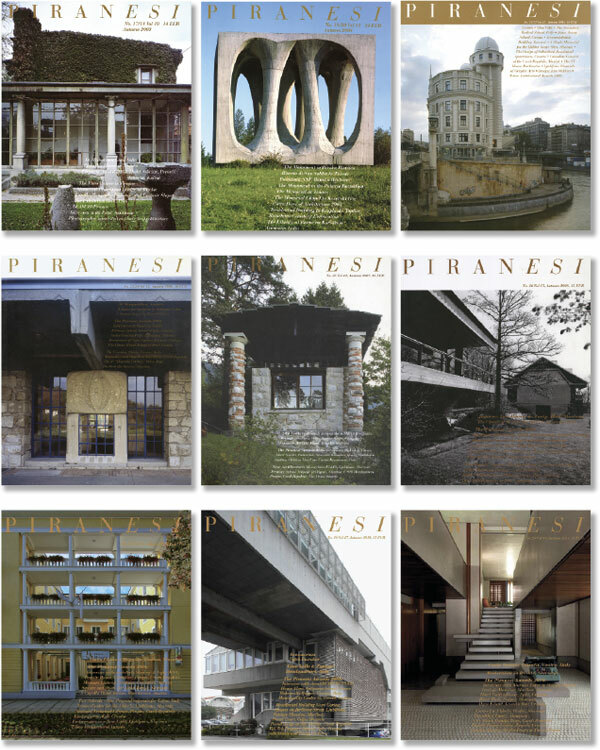 The Piranesi magazine has been profoundly linked to the Piran Days of Architecture from its inception. I well remember how the urge to ensure continuity, to leave a trace of this annual event, slowly emerged. The general feeling was that the contributions were too precious and ever so evanescent if limited to verbal communication alone. And yet, Piranesi was not an offspring of the Piran Days of Architecture. Even though the two are clearly interlinked, the magazine is not merely an outcome of this yearly event. Back then, the autonomy and identity of the magazine was discussed by the editorial staff, who immediately seemed to share common objectives and positions. There was a need to naturally reflect on the long term, the longue durée aspects of the modern (but not only of the modern) in architecture, for this significantly positioned other related values. Consequently, the magazine adopted a critical, almost indifferent, eye for the current events and news covered by other means and in other venues. This was linked to an attitude of suspicion towards any type of neo-avant-garde (neo-rear-garde, such as postmodernism) and to attention mainly being given to architecture providing testimony, able to ask pertinent questions, functioning as texts which can be reinterpreted. The Piranesi project, opting to leave aside current topics and chronicles, proved to be most ambitious and not at all without risks, for it was in search of those architectural works which could be seen as good examples of »Mitteleuropean« culture in times when Mitteleuropean as a category was seen as uncertain. The project was about a »constellation« of examples capable of describing the cultural landscape (before attempting to describe the architectural landscape), with an awareness that »landscape« is not given, but is constructed through the parallel processes of selection and choice. Piranesi is therefore a magazine with an open inclination towards trends and research rather than a magazine providing information. The architectural projects introduced by the magazine form a »constellation« rather than a system, a discontinuous and fragmented model which retains an open disposition and is itself open to long-term assessment and evaluation. The choices are not directed by a historian or a philologist, but rather by the designer »skipping« the chronological continuum and introducing architectural features pertaining to different time levels as contemporary. The architectural sample is always profoundly linked to the landscape (either natural or urban). Where the connection is based on a judgement of values, the magazine offers an interpretation and assessment of mutual influence between the context and the architecture, as well as of their meaning. Sometimes, architectural examples are chosen on the basis of emotions defined by historical and symbolic importance attached rather than by visual traits. It is known to us all that often the choice has been directed by our wish to follow, re-compose, narrate the story of »the landscape of the soul«. Yet, this landscape is not limited to an individual, its value surpasses the judgement of an individual person, as has continually been proven by the natural unanimity with which choices have been made by a most variegated editorial staff. There is no doubt that the role which Vojteh Ravnikar played as the director was of paramount importance. There is also no doubt that, as the editor-in-chief, Tomaž Brate, who also passed away well before his time, played a most significant role, for he was an architectural critic and not a practising architect. He was an intellectual closely following what was going on in the field of architecture on a European scale, he always sought to critically comprehend the collocation of each experience in a vaster framework of relations, his curious eye knew how to express harsh judgement when needed (even though this was quite out of his character), as well as how to see, from the outside (from a point of view closer to visual arts), aspects that others simply missed. If my scribbles wish to be of significance, I must finally address the question of the validity of the Piranesi project today. I believe that if Piranesi remains true to its origins, partially described above, it may very well still be topical. Twenty years ago, some of the project characteristics were close to the hearts of many. The 1970s and 1980s – during which the identity and autonomy of architecture based on its history were at the centre of our attention, while none of us could be indifferent to Frampton and his critical regionalism, a critical systematisation of what we believed to have always been – were not yet as distant as they are today. Today, when we are living in completely different circumstances, it is going to be the very degree of »non-topicality« of the initial project to determine whether this project is still needed. This precious non-topicality is what can detach us from the »dictatorship of the present« which prevails in all the forms of our existence, from the »hypertrophy of the present« which, as recently emphasised by Marc Augé, annuls both the past and the present, both the experience and the hope contained in time. The time filter allows us to reconsider, with less criticism, what (in my eyes) seemed to be excessive trust in »poetic reason«, to the detriment of »analytical reason«, by which Piranesi, silently, has always abided. Perhaps the time has come for us to reconsider and subscribe to the thoughts of Giacomo Leopardi, who in 1821 asserted that the poet and the philosopher are united in a new cognitive modality. As he put it, examine as the most cool-headed rational thinker what is only known to the most ardent of poets. Previous postSNT Opera and Ballet Ljubljana, Slovenia, 1892 Next postHappy Birthday Piranesi!